This Highlands NC townhome for sale is located at 41 Brock Court. The luxury home is in Downtown Highlands NC and boasts 3 bedroom and 3 baths. From here you can walk to shopping, dining, and entertainment. 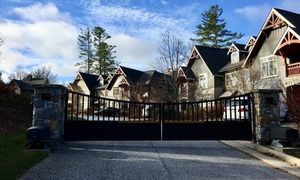 This gated community is close to everything! Contact your Highlands NC REALTOR today and shucked a private showing of 41 Brock Court. This Highlands NC townhome is well built and move in ready. The open concept design flows nicely, creating an inviting space for families. This is also a great layout for entertaining. The main living space features beautiful wooden vaulted ceilings complete with rustic beams. There is also a wet bar with a Sub Zero wine cooler and a floor to ceiling stone fireplace. The kitchen and baths feature beautiful granite counters. There are also natural wood walls throughout the home. The master suite is large and opens to the fabulous back deck. The master bath features his and her sinks, a large walk in shower, and a deep soaking tub. This luxury Highlands NC home has the latest electronic upgrades installed. Even the HVAC can be activated by your cell phone! Contact our team at Berkshire Hathaway HomeServices Meadows Mountain Realty today to schedule a private showing of 41 Brock Court. We wok forward to hoping you conduct a successful Highlands NC property search. Let our knowledge and experience serve as your guide, helping you locate a home that suits your needs and your lifestyle. Whether this Highlands NC townhome is the one or not, our goal is to achieve success.